The medieval Parish Church of Harlington, dedicated to St Peter and St Paul lies somewhat to the south of West Drayton Church, still in South Middlesex, a not particularly pleasant walk along the main road from Harmondsworth. 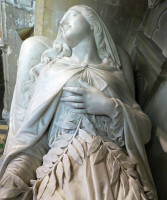 From the point of view of these pages, centred on sculpture and monuments, the Church is of interest for three important figural ones: Sir John Benett, and the two figures of the Count and Countess De Salis. 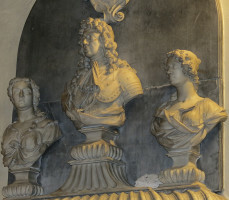 In addition, there is a portrait bust and relief portrait, both again from the De Salis family, and also several minor tablets, including one by the local firm of Burgiss of Uxbridge, and medieval brasses. Aside from monuments, there is the ancient fabric of the Church itself: let us start briefly with that. Harlington Church, St Peter and St Paul . Harlington Parish Church dates in its oldest portions from the 12th Century, including parts of the nave and most prominently, the South Door (see picture at top of page), with characteristic round arch, four concentric orders, one with Norman chevrons, and one with strange little carved heads, lions apparently, and certainly feline (see this page if you want more examples of lion heads). Much of the rest of the fabric is 14th and 15th Century, including the battlemented tower, three storeys high and with a small turret. 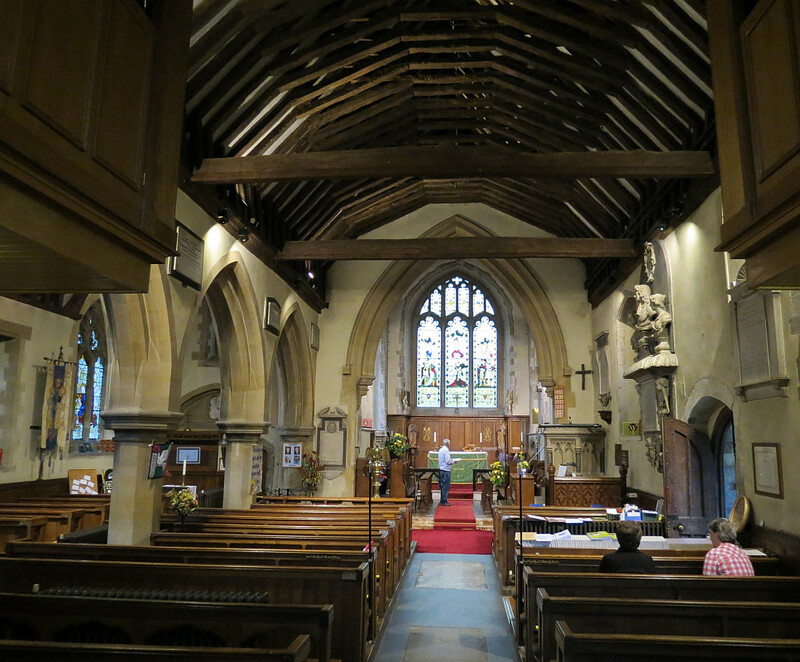 Inside, the open roof, with its many rafters and great beams spanning the nave, is apparently 14th Century too, and together with the wooden pews, though these are relatively modern, gives an evocative and medieval ambience to the interior. Sir John Benett, d.1686 , listing his august titles: ‘Knight of ye Hon. Order of the Bath, Lord Ossulston, Baron of Ossulston, in the County of Middlesex, Lord of this Mannor, a Patron of this Church’. 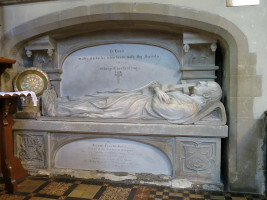 The monument also commemorates his two wives, firstly Elizabeth, Countess of Mulgrave , daughter of Lyonell Cranfeild, Earle of Middlesex, and the second being Bridget , daughter of John Howe of Langor in Nottingham. 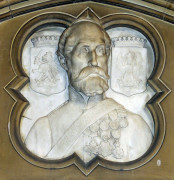 A massive monument indeed, divided into two portions, the top centred on the bust of Sir John, flanked at lower level by his two wives, and with a coat of arms above on a fine cartouche. 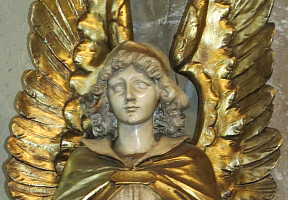 There is a solid central shelf, and then the lower half contains the inscription, with winged cherubic heads to the sides and below, joined by a garlands of delicately carved flowers. 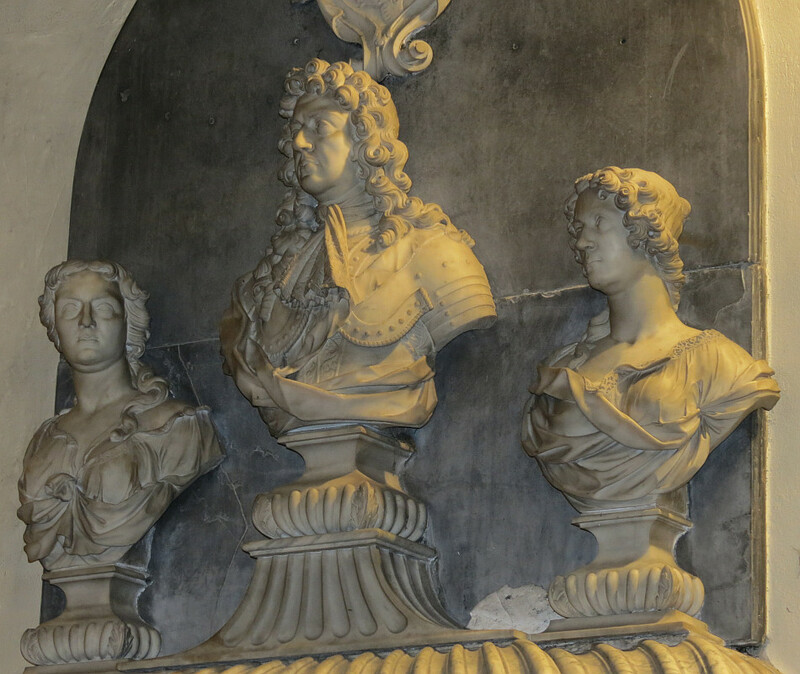 Monument to Sir John Benett, d.1686, and his wives . The portrait bust of Sir John shows a haughty face, really not unusual for portraits of the 17th Century, carved with an expressive and variable contour, a full wig of curly locks falling over his shoulders, and a neck encircled by a flamboyant neck-scarf. Below, we see his ornamented armour, covered in part by a cloak. Which wife is which? I would guess that the one on his right, or the viewer’s left, should be the Countess, and she seems older than the other. The sculptural treatment of her hair is very successful, with wavy swirls, lying along both sides of her neck, and with one loop across shoulder and breast. She wears classical drapes knotted between the breasts in Baroque fashion. The bust of Elizabeth, presuming the identification with the bust on the right hand side of the viewer is correct, shows a more youthful figure, with long columnar neck. Her hair, more ringletted than wavy frames her forehead nicely, and winds down in a single long ponytail, wound round her neck. Her drapery consists of an outer garment on top of a thinner chemise with a border. 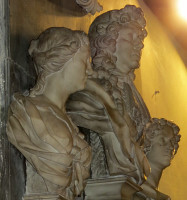 The three portraits together form a harmonious group and exemplify the high standard of craftsmanship the late 17th Century sculptor could obtain. Count Jerome fane De Salis, d.1836, by R. C. Lucas . Jerome fane De Salis, d.1836 , ‘Count of the Germanic Empire’. 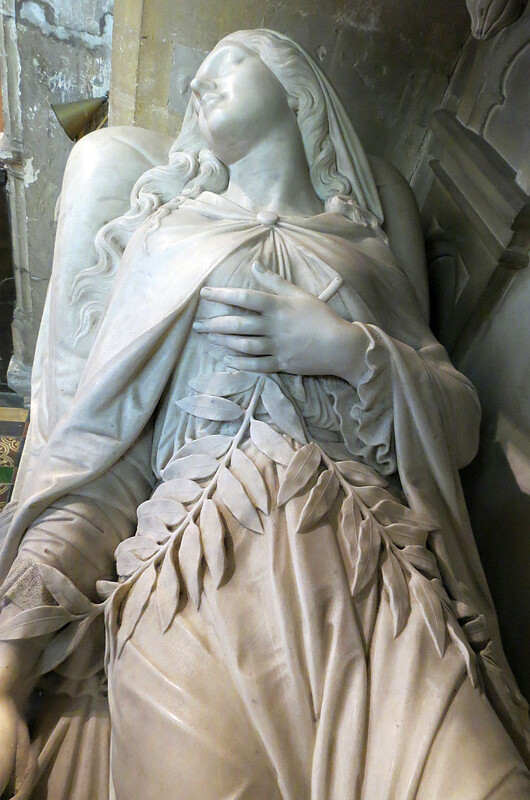 This monument and that to his wife flank the altar on opposing walls of the sanctuary. Each is formed by a niche in the wall within which is erected a tomb chest with upon it a recumbent carved effigy of the deceased, and behind, on the rear wall of the niche, further architectural decoration. 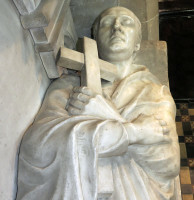 The figure of De Salis lies supported on a turned-over thin mattress forming a pillow, so his uplifted head faces upwards and towards the East end of the Church. He is wearing a long, enfolding robe, with the sleeves of his arms protruding, but covering his feet entirely. His hands are crossed over his chest, and in his left hand he holds a large crucifix. 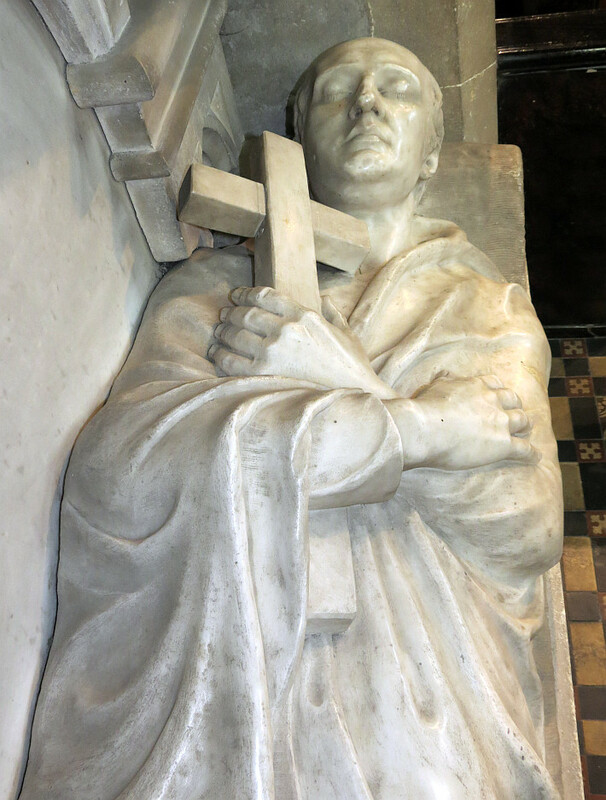 His head, with high, domed forehead and thin hair at the back, closed eyes, fine Roman nose, and thin lips, has an ascetic air, ‘benevolent, learned and pious’ in the words of his epitaph. The treatment of the drapery is clever; we see something both of the effects of gravity, and of the folds hanging downwards towards the feet, so that if stood up, the effigy would still look more or less correct. On the front of the chest tomb underneath is the inscription under an arch; the remainder of the frontage being occupied by two spandrels and two carved coats of arms at the ends. The design is echoed by the back of the niche, with a wide, shallow arch above a central marble panel, and the back and front acting as pilasters, above which hang pendants. 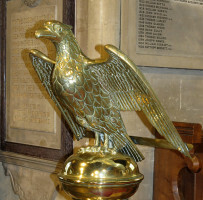 The statue is by Richard Cockle Lucas, a sculptor of some renown, who made the monument to Richard Colt Hoare at Salisbury Cathedral among others. Countess Henrietta fane De Salis, d.1856, by William Theed Yr . The Honourable Henrietta fane De Salis, Countess De Salis, d.1856 , of Pawley Court in the County of Middlesex. 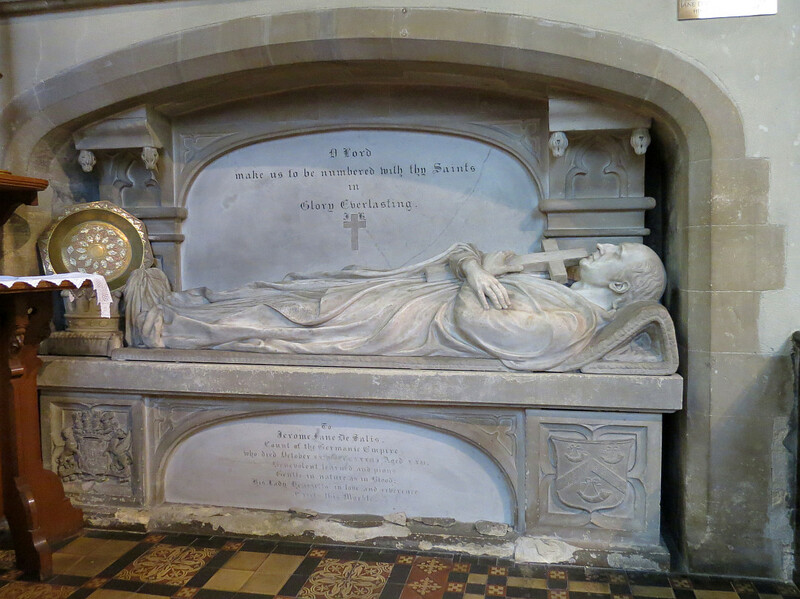 The overall design is similar to that of the Count, with tomb chest below, lying figure above, arch over inscription and arch behind, but the pose of the figure could not be more different. The Count is shown lying flat apart from his raised head, formally arranged with crossed arms, and legs symmetrically straight out with the feet resting next to one another. 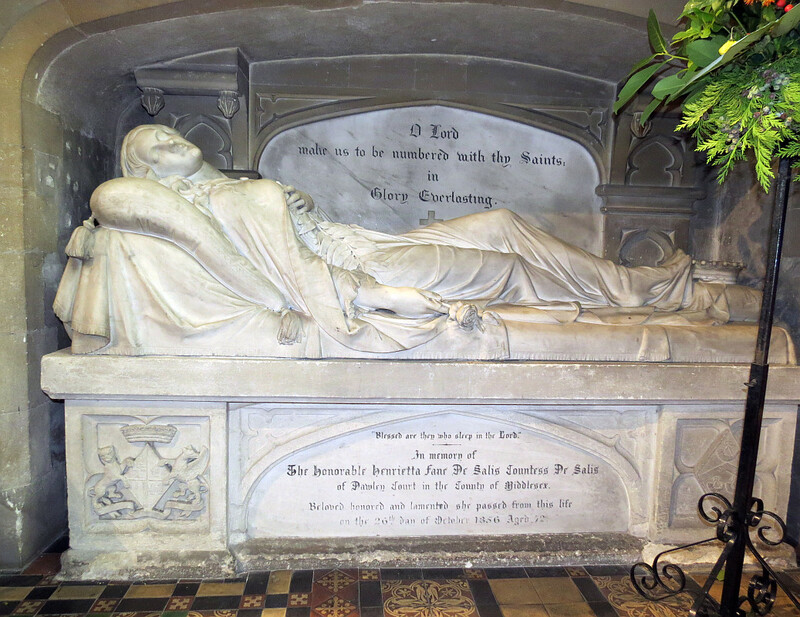 By contrast the Countess has her back and neck raised far higher, her legs crossed, hands asymmetrically disposed and head turned outwards, as if she was in restless sleep and about to awaken. She is a beauty – young, with symmetrically rounded face, plump in the cheek and chin, eyes shut but with obviously large orbs, the slender nose of a patrician and full lips denoting youth and seductiveness. She wears a mantle over a thin garment which as for her husband, covers the feet, though leaving them nicely outlined to show the delicate arch of the foot from rounded heel to charming toe; her arms are sleeved and frilly. Her hands are perfect and expressive with slender, tapering fingers: one rests on her breast, above her heart, with under it two branches of olive; the other hand, by her side, holds a plucked stem bearing two roses, one open, one a bud plucked before it could ripen. Truly an exquisite memorial. The sculptor was William Theed the Younger, a most prolific Victorian sculptor who made many good things, including three figures for Burlington House, home of the Royal Academy, and statues across England including several in Manchester (see this page). Lieutenant General Bodolph Fane De Salis, d.1880 . Lieutenant General Bodolph Fane De Salis , Colonel of the 8th Regiment of Hussars at Balaclava, d.1880, by J. Edgar Boehm, another notable sculptor of the period, who specialised in male portraits, and whose most well known work is the statue of Wellington on horseback facing his residence at Hyde Park Corner, and surrounding figures. It is made as the top of a broad Tudor portico, with the inscription across the whole width, and above, in what might be termed a Gothic pediment, were there such a thing, is a bust of the deceased in a quatrefoil; the surround being in stone, the bust in white marble. We see an elderly man, with beard, heavily whiskered, and a look of fortitude and stubborn endurance. He wears a turned-up collar to his military jacket, and many medals, and lightly carved in the background are two coats of arms, crowned. William Fane de Salis, d.1896 , and wife Emily Harriette, d.1896 , unfortunately with seating now against the monument; we can appreciate the need while deploring the necessity. 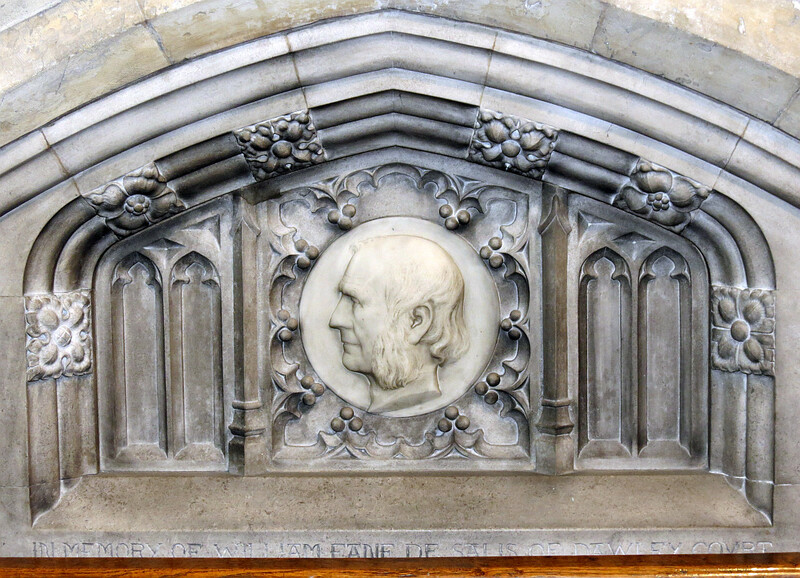 At least the profile portrait in low relief can be seen, as an elderly man with sideburns and a determined but somewhat careworn look; he reminds me of Trollope’s The Warden . 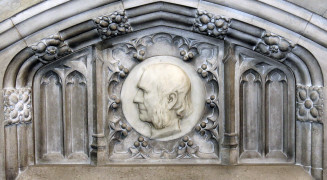 The surround is the central portion of a Tudorish Gothic pediment of stone, with the portrait in a whiter marble roundel and surrounded by groups of three small baubles, and with carved flowers, rather stylised, in squares on the frame. William Fane de Salis, d.1896 . Revd. 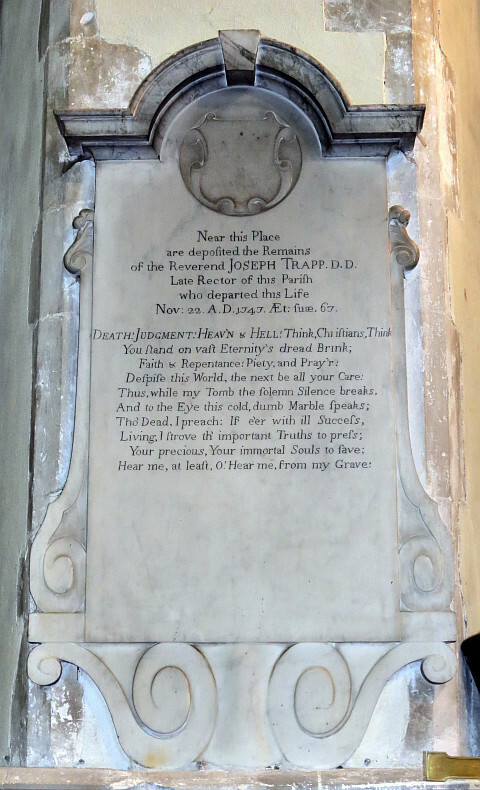 Joseph Trapp, d.1747 , Rector, with a short poetic sermon, which unusually refers to the monument itself: ‘...Thus, while my Tomb the solemn Silence breaks,/ And to the Eye this cold, dumb Marble speaks; / Tho’ Dead, I preach...’ Rather an unusual monument altogether: the panel is rather large for the inscription it bears, and has at its sides two of the common scrolly devices, reaching almost to the top, but cheese-paringly thin, while at the base is an oversized scrolling. Above the inscription is a shield of arms carved in relief within a circle, and above this a thick shelf which rises in a semicircle to a keystone. Robert Cooper, d.1752 , Rector of Harmondsworth, with a short Latin inscription, plain panel in a moulded dark border. 18th Century Classical tablets: Revds. Trapp and Williams . Revd. 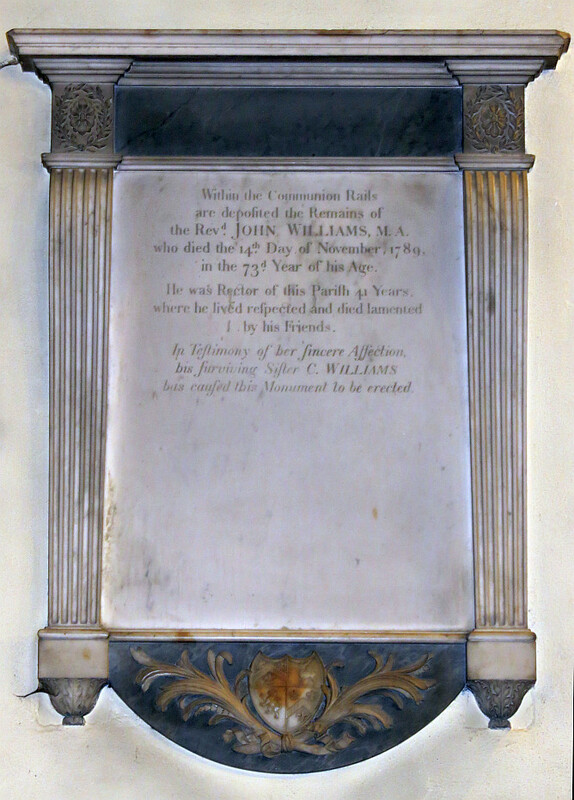 John Williams, d.1789 , long time Rector of the Church, put up by his sister. Panel with fluted side pilasters, upper entablature of dark marble, and an upper shelf. Below, a dark curved apron bearing a coat of arms with two crossed branches, carefully carved. The brackets on each side bear lightly carved leaves. 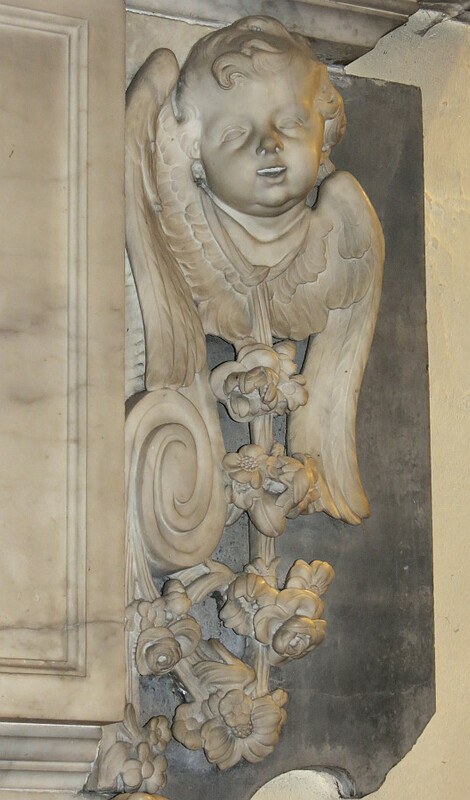 One further bit of ornamental carving is the little flower and wreath in low relief above each pilaster. 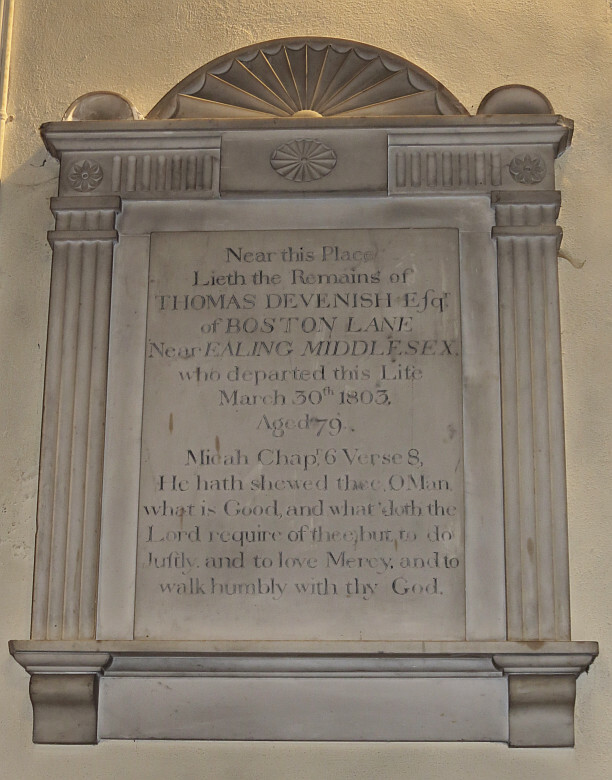 Thomas Devenish, d.1803 , of Boston Lane near Ealing, with a Biblical quotation. Rather an elegant Classical panel (see picture at top of page), with fluted side pilasters supporting a fluted entablature with upon it two small stylised flowers and a central circle with radiating segments; above, a sort of pediment is formed by a section of a larger, similar circle with segments. To the side soft this are rounded ‘ears’ or acroteria. At the base, a projecting shelf over a plain apron with two moulded brackets. Isabella Ann Davison, d.1820 , with the briefest of Latin inscriptions, on a nipped white panel on a grey, streaky backing. Hannah Youdan, d.1829 , and daughter Mary, d.1848 . As a tomb chest end, with upper shelf above which is a lid, little feet below, and on a shaped black panel. The panel, simple as it is, is of interest as being an example of the work of Edward Burgiss, of the firm of that name in Uxbridge, just a few miles to the north. 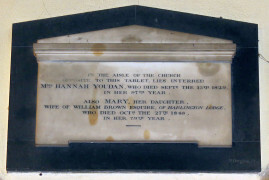 Early 19th Century: plain panel to Hannah Youdan by E. Burgiss . Elizabeth Hinds, d.1830 , and husband William Hinds, d.1850 . Plain rectangular panel with rounded upper edges, on a black backing panel, with a small central bracket. A praying ecclesiastic , half figure, with a fine high collar, and rather simple but elegant drapes. He is shaven-headed in the fashion of a monk, beneath which he has wavy hair. Beneath is just two lines of an inscription in difficult to read script, with presumably the name scored out. 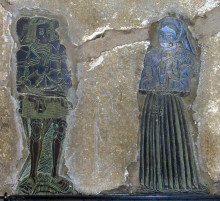 Apparently this is the brass to an early Rector, John Monemouthe [Monmouth], d. 1419 . Gregory Lovell and wife, 16th Century . 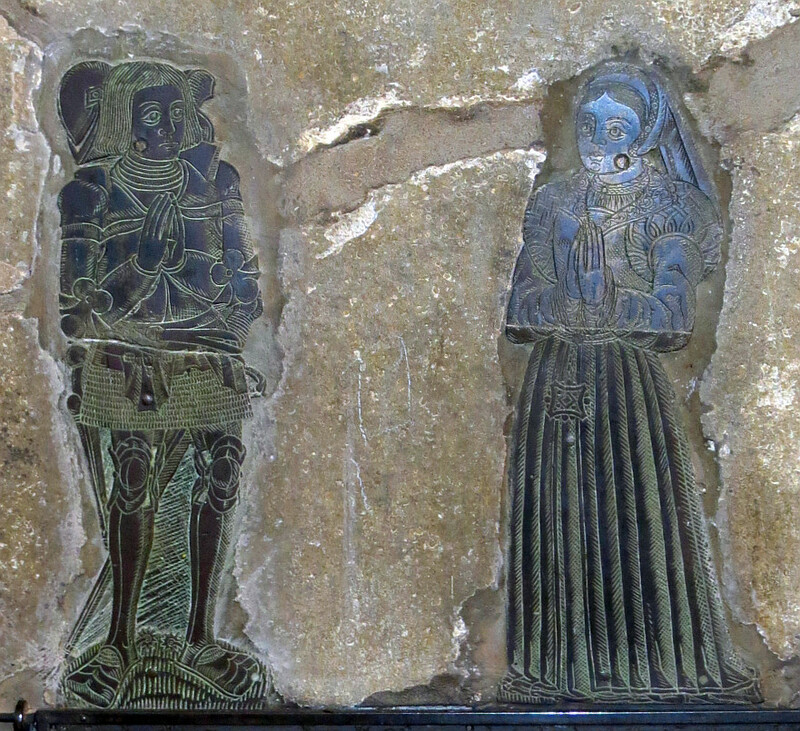 Brasses to Gregory Lovell, d.1545 and wife, from a canopied altar tomb forming an Easter Sepulchre, according to the Victoria History of the County of Middlesex. Remaining, we have the inscription, difficult as ever to decipher, two heraldic shields, and two splendid figures. They are set standing close to one another, facing not so much in three-quarter view but slightly towards each other, and both are praying. He wears armour, a kilt, and has those broad-toed armoured shoes that look so wonderful and so unlikely on suits of armour. He is beardless, and has chin-length hair combed symmetrically and straight on each side of his face. His eyes are large and he looks young. Behind him is his helm, which fits with this slab having been originally horizontal, perhaps, so that he was shown lying with his helmet as a cushion. His wife wars a puffy-armed top, with embroidered collar, and an elegant dress which covers her feet; on her head is a veil, and she too is youthful, with large eyes and a pretty little mouth. How similar in clothing, yet different in character, from the sculptural monuments of the period. Beneath all this, we see the settings for further, removed brasses, which seem to have included two or three figures. 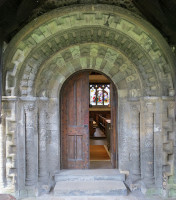 The canopy survives as a separate piece, with her coat of arms surviving, as a stone, Tudor fireplace-like structure; the Royal Commission of Historic Monuments described it as an Easter Sepulchre. 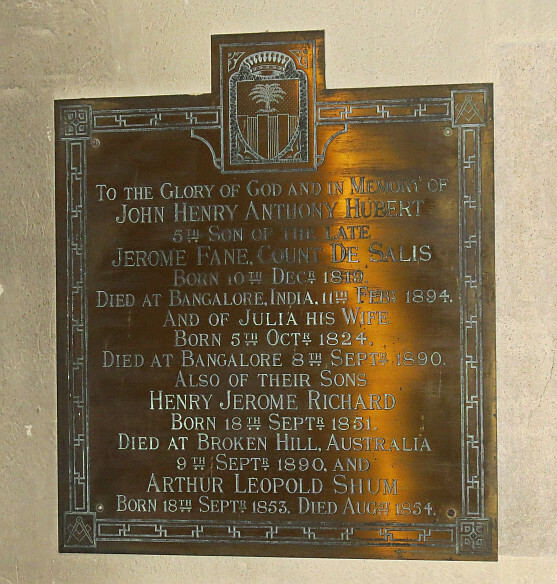 John Henry Anthony Hubert, d.1894 , in Bangalore, a son of Jerome Fane, Count de Salis, and wife Julia, d.1890 , and two offspring. 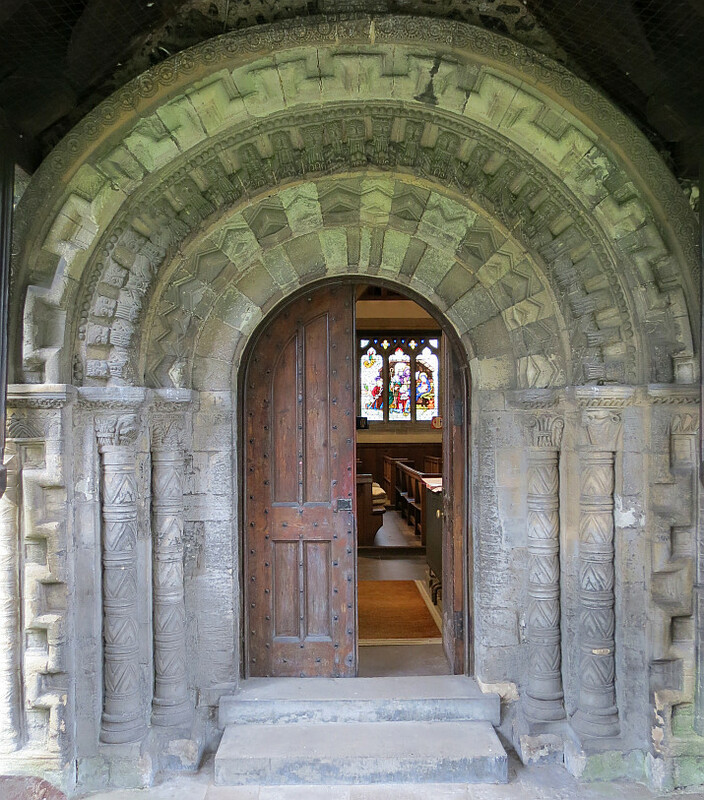 With inscribed coat of arms at the top, and repeating pattern round the edges (picture below). One of the modern brasses . The Hon. Leopold Fane De Salis, d.1898 , wife Charlotte, d.1878 , and son Rudolph, d.1876 . 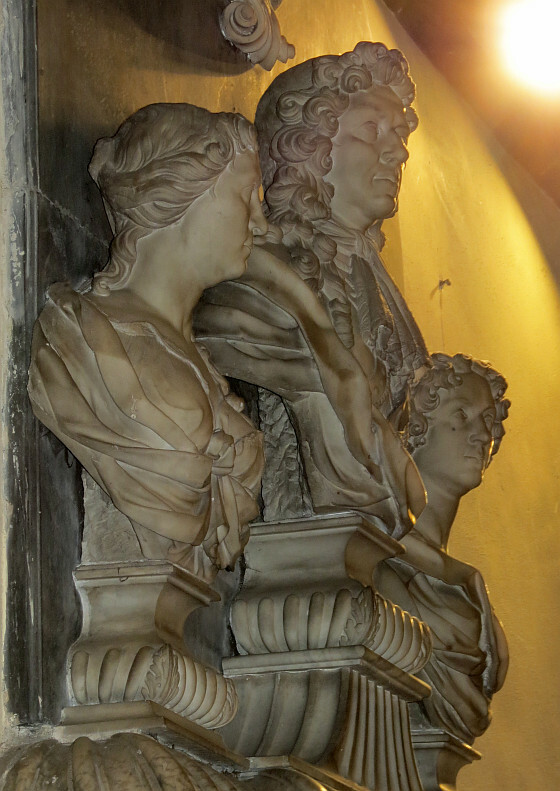 Another of the De Salis family monuments. Rather more ornate than the norm for brasses of this period; raised lettering on black, within a frame of repeating leaf design, and with the coat of arms at the top. 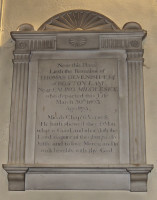 Edward Isaac Haddork, d.1904 , Rector, the inscription in raised text, and noting that during his incumbency he had the Church restored and enlarged. The text in black-letter, and there is an inscribed border of repeating clover leaves, with Celtic crosses at the corners. Herbert Wilson, Rector 1905-29 , in nice curly text, with an inscribed line border. 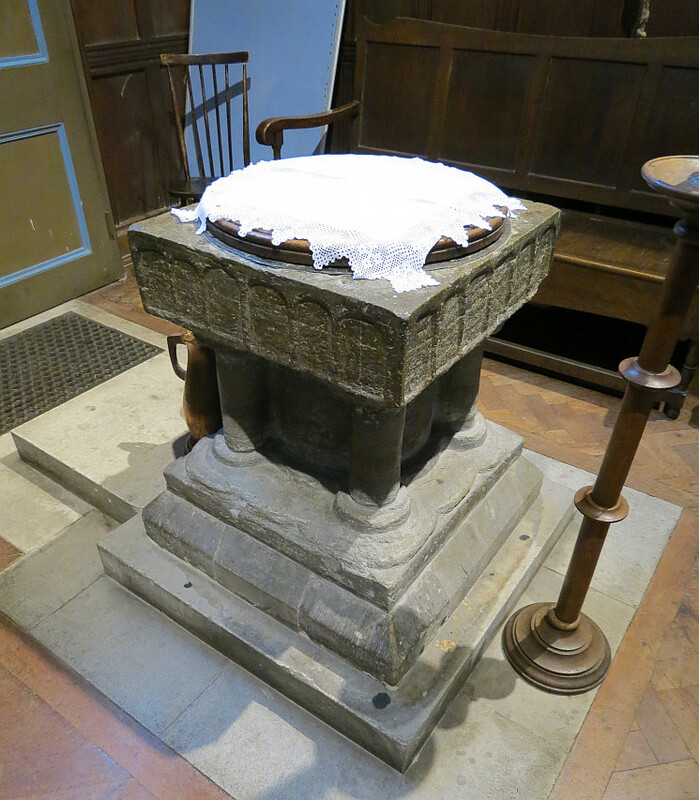 The Font , dating from the 12th Century, as old as the Church itself, with square bowl supported on a great central pillar, surrounded by four attached pillars with ruined capitals. The sheer impression of solidity and massiveness is characteristic of many fonts of this period. 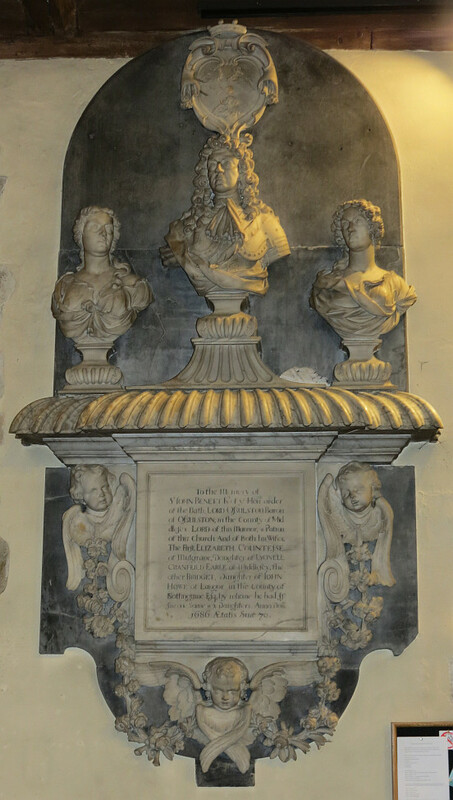 A 1712 panel put up by the Archdeacon of Dorset, Robert Cooper, recording the Lady Letitia Pointz (once Coppinger)’s charitable donation of 1610 to the poor and the Rt Hon John, Lord Ossulstone’s of 1691 [see first monument noted above] for apprentices. Dark panel in probably more recent marble surround. 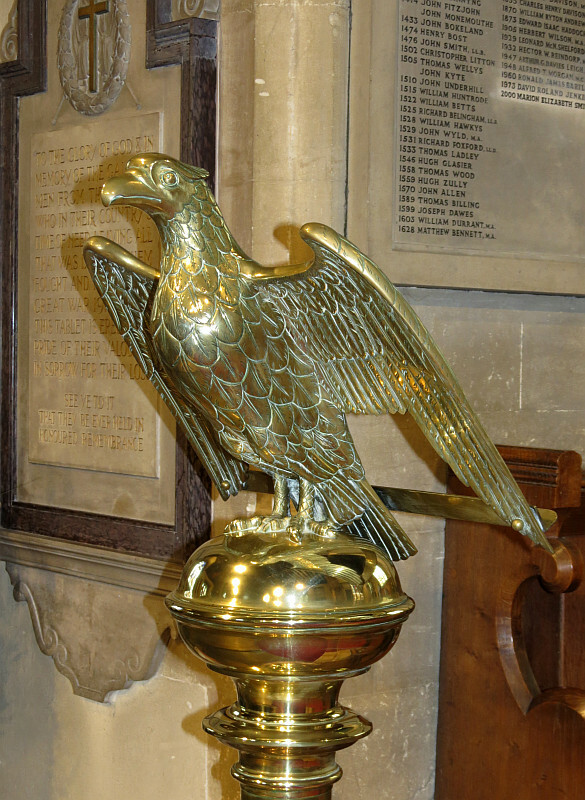 A brass eagle lectern , presumably 19th Century, in a medievalised style. Harlington's 12 Century font, and 19th Century lectern . 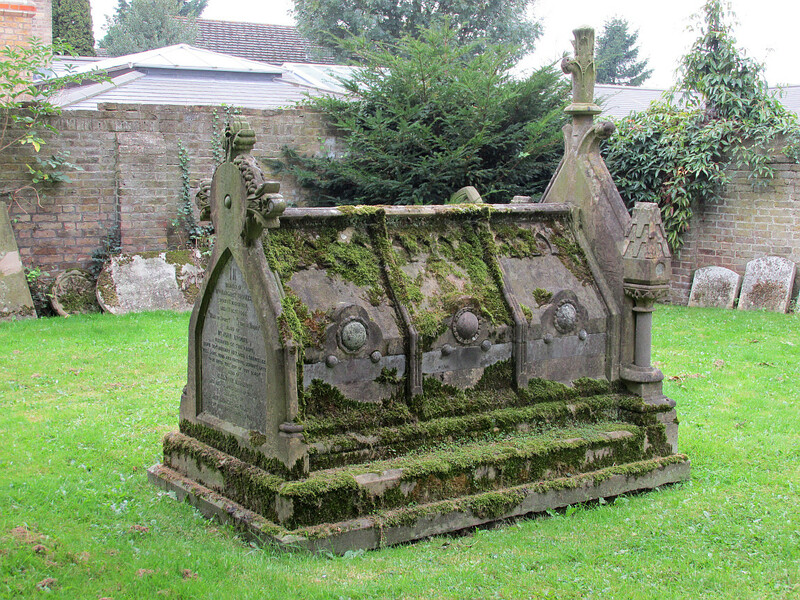 Under a window, three small panels recording the burials of more of the De Salis family , the central one of which bears a coloured coat of arms. 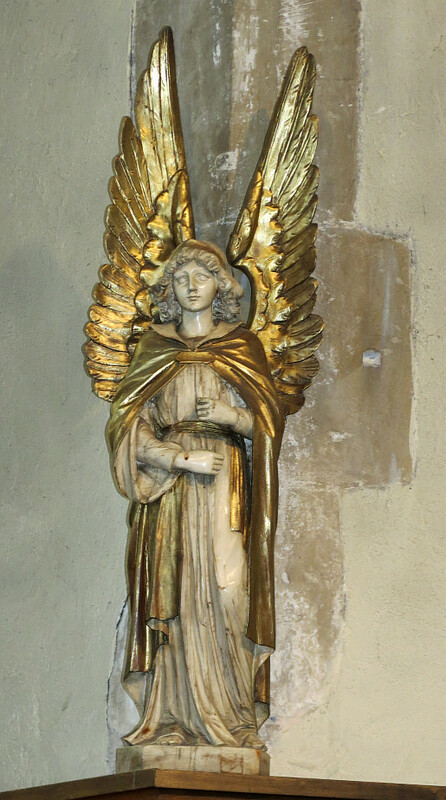 Little statues round the altar table , two wooden saints – we hardly need the accoutrements to identify them as Saint Peter and Saint Paul – and two sweet angels, with gilt wings and mantles, one of which is pictured at the top of this page. 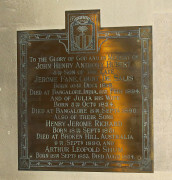 A memorial tablet to men of the Parish who fell in World War I , with a gilt crucifix above the inscription enclosed in a wreath, and with carved low relief crossed spears and drapery in the background. The panel has a dark frame, with a narrower portion at the top, to allow for curly side pieces on the upper portion, beneath a substantial stone curved, broken pediment. There is a supporting shelf at the base. 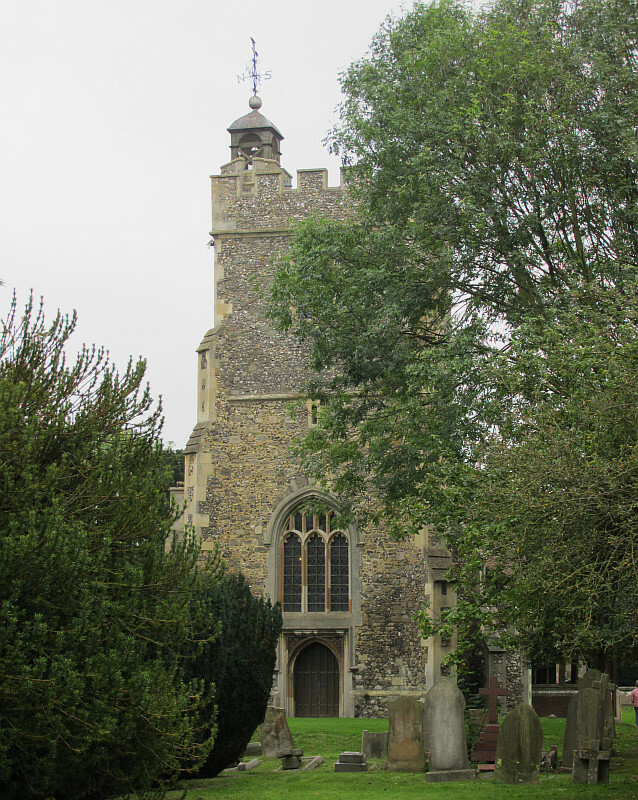 A picture of a yew tree at Harlington Church, 1729 cut in topiary excess to represent a strange steeple with a cockerel on top. 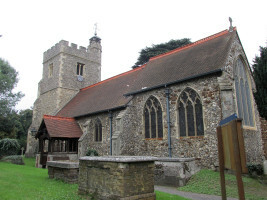 Outside, the Churchyard stretches off in a long, relatively thin piece of greenery enclosed by a brick wall, fence, and hedge, with thick yew trees near to the Church so that the further areas feel remote. The monuments have been kept mostly free of ivy, but allowed to sink into the soft ground, slumping and cracking and collapsing. Near the Church is the World War I memorial , as a granite Churchyard cross in Celtic form, with characteristic looping geometric designs on the crucifix, a bare shaft, and the inscribed names of the fallen on the heavy base, with a step below. Carved ship in relief on the Hohlsson tombstone . We see a couple of tomb-chests, from the beginning of the 19th Century and later, and rather more graves of the form of an enclosed plot long enough for the coffin, with stone surround, raised corners, and at the top, a headstone or crucifix raised on steps. One or two ledger stones too, with cracked, broken and sunken tops. 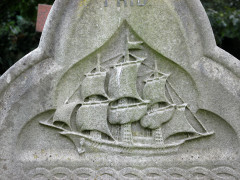 There is a small amount of sculptural decoration here and there, mostly from the early 20th Century: a ship in relief on the tombstone of Captain Olof Hjalmar Hohlsson , born at Ellishult, Sweden, and died in Harlington in 1920, and his wife Emelie Albertina , also from Sweden; the odd headstone as a carved book; a couple of little angels, and a relief of a pensive young woman, standing finger to lip, in memory of her devoted husband Percy A. Salter, d.1934 ; a few bits of broken pots from collapsed tombs placed in a corner. And a very late Arts and Crafts tomb, in terra cotta, to Herbert Wilson, d.1929 , Rector or Harlington, with a large collapsed crucifix and two kneeling infant angels. 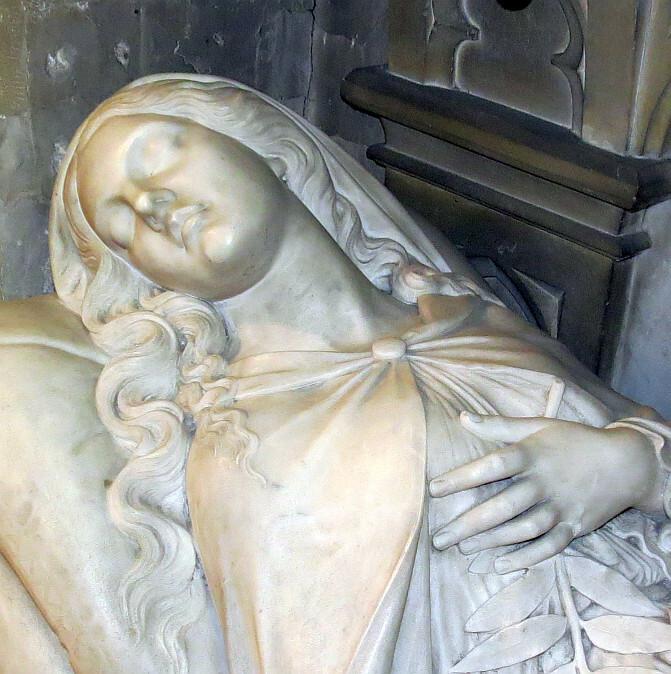 Mid-19th Century Gothic chest tomb . 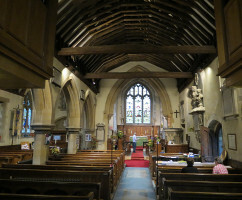 With many thanks to the Church authorities for permission to show pictures of the monuments inside; their website is http://www.stpeterandstpaul-harlington.org.uk/church-history/.